Here is this morning’s sermon after being verbally accosted in Westfield’s 1923 Ladies’ Parlor by a member of another church. The scripture was John 3:1-17. Nicodemus thought the same. You see, Nicodemus, Nicky for short, was a Pharisee. Pharisees were leaders of the Jews and it was their job to know things. They knew the law and the prophets. And they knew, or at least were supposed to know, about people. And one of the things Pharisees knew about people was that they didn’t change. Now, that’s interesting. This Pharisee, this one who’s a leader of the Jews, who’s supposed to know everything, is calling Jesus Rabbi, or teacher—which means Nicky is a student. And students don’t know everything, or they wouldn’t be students, right? And Nicodemus says what we’re all thinking: WHAT?! Nicodemus, in true Pharisee-know-it-all style, tries to catch Jesus. He phrases it as a question, but he’s really trying to prove one of those inalienable truths: death, taxes, people don’t change and you can only be born once. Jesus replies, “No one can enter the kingdom of God without being born of water and the spirit.” This floors Nicodemus. “How can this be?” he asks. Because, you see, you can’t be born again and people don’t change. But Jesus does a curious thing: he says they can and they do. Which is great, right? That’s good news! People can be born again. People can change! Except when they can’t. Or don’t. And this is where we encounter one of the great barriers in modern day Christianity. This story from John has launched whole theological movements around the ability not just for change, but to be born again. 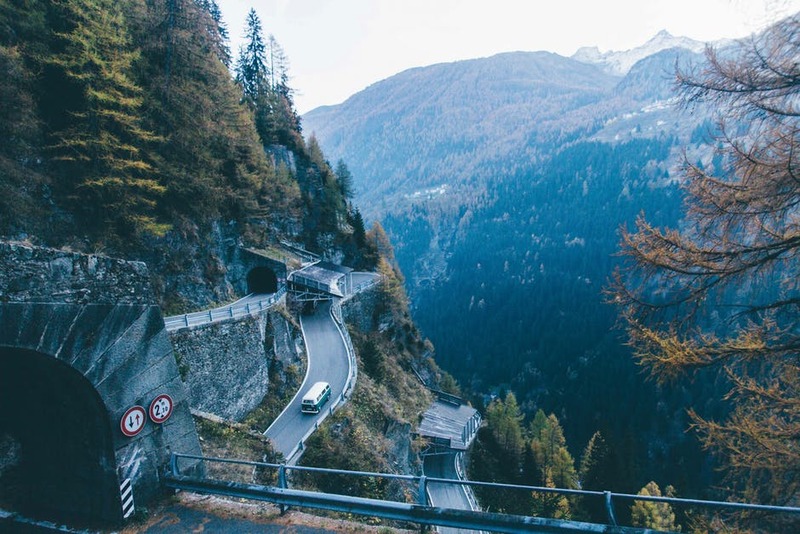 In some traditions, there are very particular conditions about what it means to have been “born again,” a checklist of sorts that verifies the veracity of the claim of being born again. There are others who would say, “Oh, that’s just Jesus talking” and they group it with the other hippy-dippy nonsense Jesus tends to spout off. It seems to me, that we’re somewhere in the middle: not quite willing to be the gate keepers of someone else’s salvation; Not quite willing to write Jesus’ teachings off. So what is it people like us, middle of the road people, take from this passage? Our first gleaning is that people can change, and that they do. Some might call that Salvation—that our brokenness, that the things that separate us from others, those barriers, can be removed. Man, this is GREAT! This is Good News! That the change we are longing for in ourselves and in other people, that our brokenness is something that can be changed, is something that we can be saved from. And here’s the best part of the entire passage–it’s a single word: whosoever. Not some people, not if you are the right color or love the right person or are the right nationality or voted for the winning candidate. None of that matters—whosoever can be born anew, whosoever can change, can start again. Whosoever. We like that—we, as a congregation, as a community of people committed to welcome—like whosoever. We like saying everyone, everyone, EVERYONE, don’t we? As long as that everyone fits into our tidy little Sesame Street definition of sunshine, rainbows and getting along. But I know and you know that it’s never that easy. Now let me hit pause here to confess: I was tired, I didn’t want to be there, and I had just checked the door to be sure it was unlocked—which it was. “It is unlocked,” I said. “No, it’s not,” she snapped, standing in the doorway to our ladies’ parlor. You know those moments in time when you clearly see a decision before you: you can just let it go, take the high road. Or you can dig your heels in and prove your point. Usually, I’m pretty good at taking the highroad, at letting it go. But every once it a while, I miss my turn, and before I know it, I’m on the low road, digging my heels into the muck and mire of being right. “Yes, it is,” I retorted incredulously, rolling my eyes. Then I walked away. “Fag!” she shouted after me. I stopped in my tracks, heart racing. Listen, this person clearly has issues. And I’m not telling you this story for your sympathy. But rather, to make this point: this is where Jesus’ whosoever pisses me off. Because, if I’m honest, I don’t want her, the woman who called me a fag in my own church, to be part of that whosoever. I don’t want her to be part of our everyone, everyone, everyone. And let’s be clear: her behavior doesn’t have a place here; her behavior is NOT welcome here. But when Jesus said we could be born again, that we could change, that salvation could belong to all of us, he meant it. 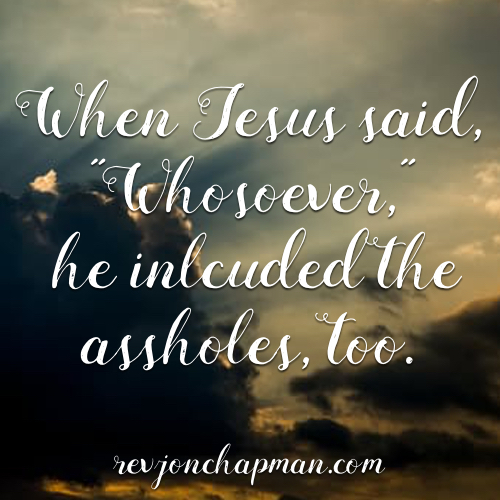 When Jesus said “whosoever,” he included broken people acting like assholes, too. And you know, that is Good News. Because last night, it was her. But it could’ve been me. Or any of you. Your mama might’ve told you that people don’t change. But Jesus says they can. And that’s the hope I’m going to hold onto. Simply, I’m so sorry someone said such mean things to you. You are a grown up, and you don’t need such childish remarks from anybody. Jon, I was bullied so badly in 7th grade I had to switch schools halfway through the year. The emotional abuse (I hate the word “Bullying”, because it simply isn’t a strong enough word) gave me terrible headaches & I was sick to my stomach everyday. Once I was in high school, I took Graphic Arts at a technical high school. Thats where I found “my people” & we all became friends. Anyway, fast-forward to 25 years after graduating in 1985. I had never been to a class reunion because the only people I would want to see again were the people from my shop. Since Facebook had become so popular, we all started looking each other up around the same time. Turns out none of us had ever been to a reunion, so we all decided to go to our 25th together. I was only there for about 10 minutes when a woman came up to me and tapped me on the shoulder. I turned around and did not recognize her. Then I saw her name tag. She was one of the worst abusers that I had experienced in seventh grade, the ringleader, the one who had started it all. She looked at me with tears in her eyes and said “I am so sorry. You never did anything to me. I am so ashamed. I had no right to do what I did to you.” Then She explained that now she had children of her own and that every day when they went to school she thought about me and her biggest fear was that they would meet someone like her. She asked for my forgiveness, which I in turn gave to her. Then she asked for a hug and I we hugged.. After that, I had two more people who were also my abusers come up to me and apologize. However, there were still a few others that also made my life hell that just kept glaring at me and not saying a word. I like to think it was because I still looked the same but they looked 25 years older! LOL! In reality, they were still the same miserable jerks that they were in school. I was no longer mad at them, because I thought how much they had missed out on, not being able to evolve & grow. How sad to be that miserable for so many years. Anyway, in closing, I have seen it with my own eyes that people can and do change & we can always have hope. I have also known people in my life that lived their entire lives without ever changing before they died. It is nice to know though, that it is possible. Thank you for sharing that. I am still very hurt by this and felt it was difficult to stay and perform knowing this went on. I prayed for this person, for you Jon and for all those who suffer because of others close minded opinions… I had a race yesterday otherwise I would have been in church to offer my heartfelt love and support to you. Oh Jon, this is wonderful! So human, so wise, and I am so grateful to call you a friend. What was is that Harry Fosdick said?? Hating someone is like burning down your own house to get rid of a rat. The reality here Jon is she is probably mentally ill. There is difference in calling someone a name, using what ever excuse they choose and spewing venom, which has no excuse other than a few cylinders not firing on that engine. I have been called worse by better, don’t let it bother you a single second longer. I just want to say that you are completely amazing! To take such hateful words and analyze them and to come up with the conclusion that even she is part of whosoever and that she too can be saved and in God’s grace. I am very honored to have my daughter look to you as a role model in gay pride. Thank you for being such an amazing man with amazing faith. because you are such a wonderful human being. Marty and I are deeply hurt by what happened to you on Saturday.